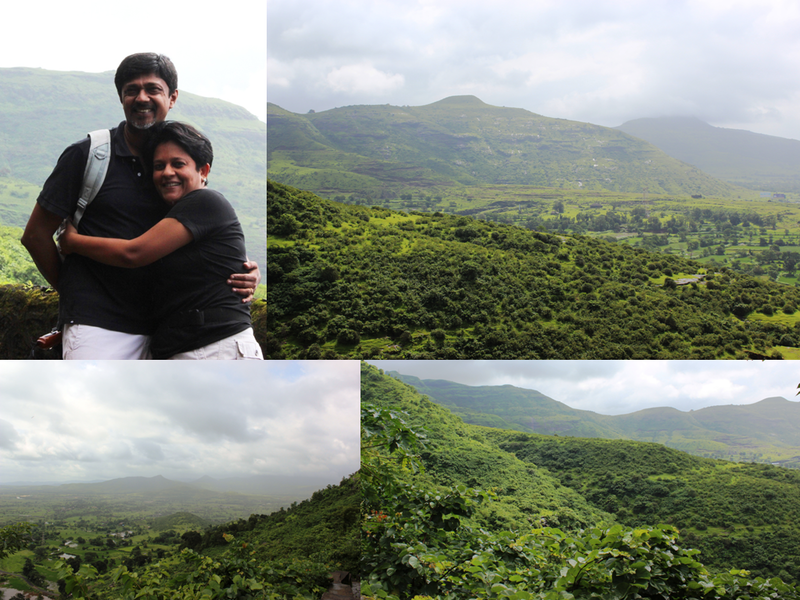 Ever since the monsoon season started, I have been wanting to see the Western Ghats in all their green glory. 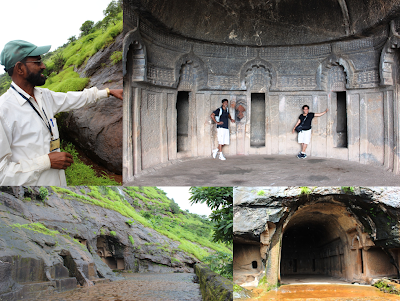 Finally we found the time, a perfect day, half sunny, half cloudy, and we set out for the Buddhist Caves at Bedse. Most people living in Bombay don't know that the spread of Buddhism on the West Coast of India began in the Mumbai Metropolitan Region; in what we today call Nallasopara (the next train station on the Western line immediately after Vasai). The Mauryan Emperor Ashoka (273 to 276 BC) sent an emissary called Dharmarakshita to Sopara (it was at that time major trading port). Ashoka's Edict at Sopara is now in the Prince of Wales Museum, but you can see a photo and translation of the edict here. The Buddhist monks found the perpendicular cliffs of the Sahyadris eminently suitable for their monsoon prayer retreats. What may have started as a small rock-excavation experiment of the monks turned into a very major architectural trend, with over 1200 cave temples excavated in India. Of these, 800 are in Western India, and thankfully for Mumbaikars, several of them are very close to Mumbai. With about 2 hours of drive (from Sion), we made it to Bedse. On the way, we saw several waterfalls, and the mountains clouded in beautiful mist. 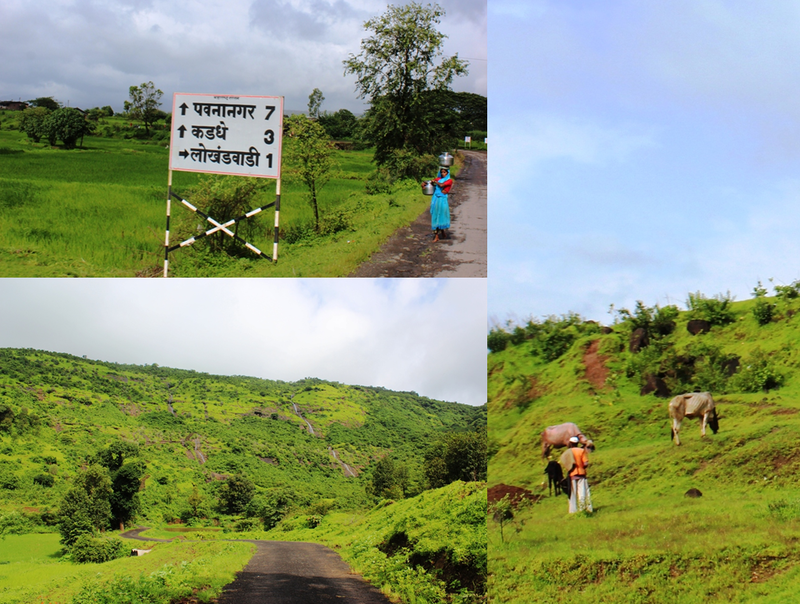 Once we cleared Kamshet and turned off into the rural areas, we were in for a visual treat. Everything was green and moist, with countless small waterfalls. It was very quiet, with no traffic noise. There were cowherds everywhere, keeping an eye on cattle. Women of the villages walked by the side of the road, fetching water and washing clothes. The road went right upto the base of the caves; although it was narrow and could take only one car at a time. From the base of the hill, there are 450 steps up, to reach the caves. The climb is spectacular, green, inviting, with beautiful views. You can stop every now and then to catch your breath and admire the scenery. I got my first very beautiful photo of a little frog, who was perhaps frightened into stillness by our proximity. Steps with lots of space to rest. They were slippery in the rain. Once we huffed and pufed our way to the top, we got our first proper glimpse of the cave entrance: a grand pillar half-hidden by the rock. It lay to our right, inviting us in. To our left was a small stupa, and near the stupa were the underground water cisterns, cleverly designed to store drinking water all through the year. 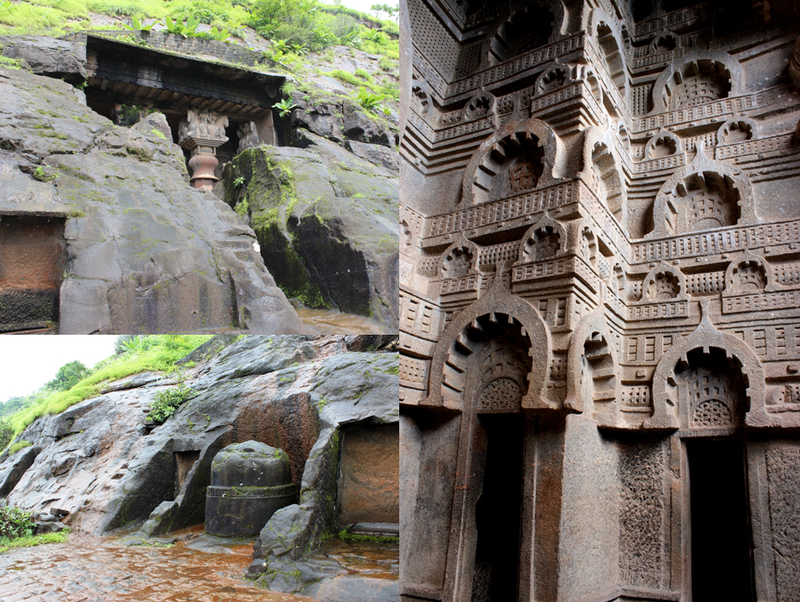 We walked into the pillared entrance, and found some stunning carvings waiting for us. Because we went early, we had the entire place to ourselves (awesome!). The earliest Buddhist caves in the Deccan belong to the Hinayana faith, and were excavated between 2 BC and 2 AD. Bedse, along with its neighbours Karle (Karla) and Bhaja, belong to this early phase. The primary enabling factor was the rise of the Satavaahanas, a dynasty that practised Brahmanism (a Vedic religion which was a predecessor of modern-day Hinduism). The Satavaahanas brought peace and prosperity to the Deccan; it was a period of flourishing trade with the Mediterranean as well as with other parts of India. The Satavaahana kings seem to have been perfectly happy to let Buddhism flourish. Maybe the lines of division between various sects were not as sharply defined as they are today; or maybe they were secular leaders. Or maybe the Brahmins did not perceive these monks as any sort of threat to their way of life. Who knows? We entered through the pillared portico, and saw a beautiful chaitya-griha (prayer hall) of the Hinayana style. Here are the typical characteristics of a chaitya-griha in Buddhist rock-cut architecture: you can see ALL of them in the chaitya above. 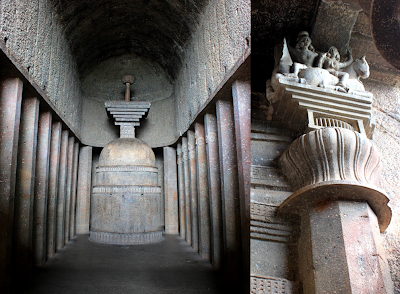 First, the typical chaitya is apsidal in plan. 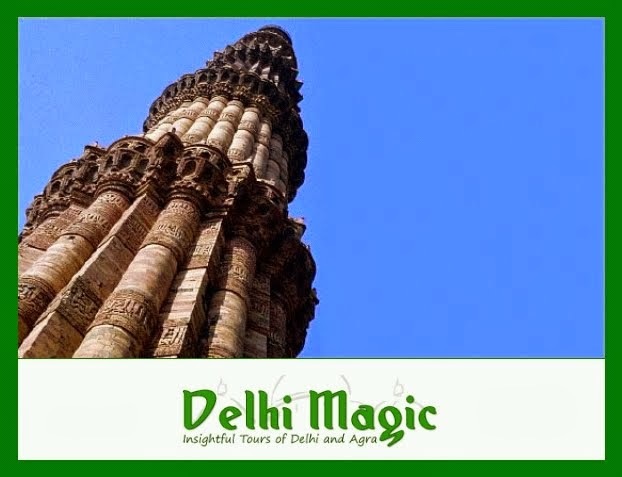 Apsidal means that the altar end of the chaitya is curved in a semi-circular fashion. 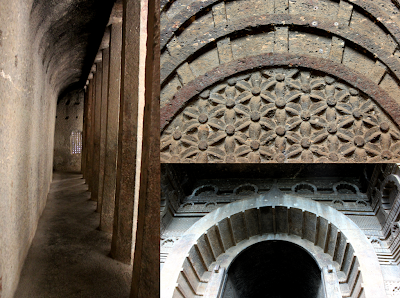 In Buddhist chaitya-grihas, you have a long rectangular main body, with an apse at the end. Second, the roof is usually entirely barrel-vaulted from end to end. In fact, I have not seen any Buddhist chaitya without a vaulted roof. Third, the nave (the main central part of the chaitya) and the sides are clearly defined through a series of pillars. Fourth, there is a stupa (containing sacred relics, usually ashes of monks) at the remote end of the nave. Fifth, if a chaitya-griha belongs to the Hinayana period, you will not see carved images of the Buddha (this is why I simply LOVED the caves at Bedse, not a single Buddha figure anywhere, stark, simple, a place of meditation and prayer, a philosophy rather than a cult, and a true reflection of Buddhism as the Buddha conceived it). There are more reasons why Bedse is the perfect specimen of a Hinayana settlement. In determining the chronology of rock-cut caves, architects usually look at how closely the features tend to copy wooden prototypes. 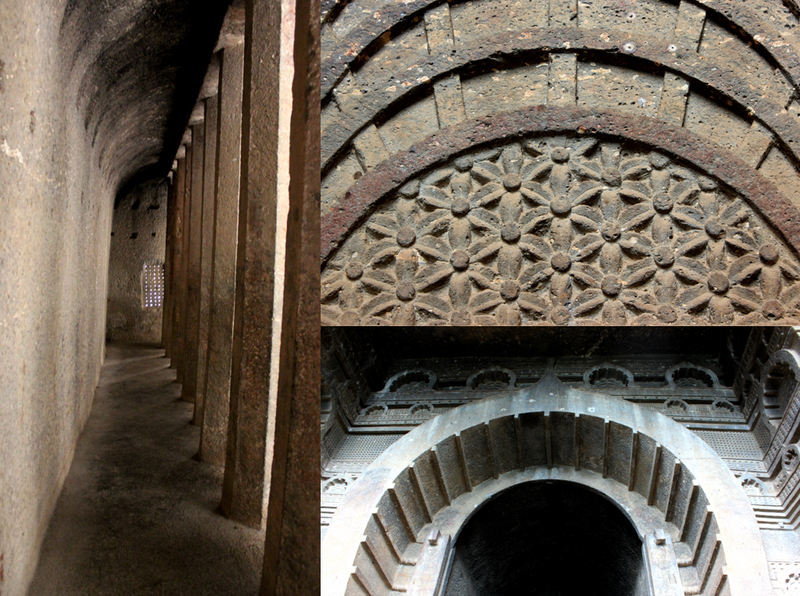 The older a chaitya-griha is, the more likely it is to have wood-like carvings and features, including grilled lattice-work windows. I was delighted to find all of these at Bedse. Sanghaarama/vihaara with rock window and residential cells. We had to walk through a mini-waterfall to enter. The Sahyadris are truly a treasure, they are my escape when I want to get drunk on the beauty of nature. So close to Mumbai, and so accessible! Especially in the monsoons, there are so many waterfalls everywhere and so many things to see. Bedse Village at the base of the mountains has a lot of rice farming going on and it's fun to walk through the narrow road that goes through the village (I like to make-believe that I am a farmer, OK, I know that is stupid!). But seriously, don't wait for the "right" day, don't let the weather or work or the daily grind get to you this monsoon season. Take a day - you need just half a day, really - and go out to the mountains. They are there, waiting for you...go today if you can! I promised a second instalment of special monsoon veggies and fruits, so here they are! 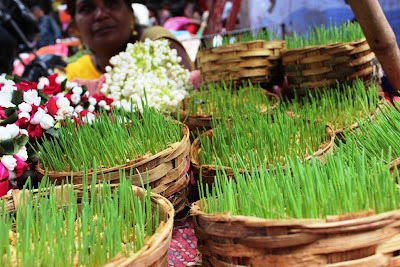 The bazaars are very exciting these days, and I am enjoying walking around with my camera. 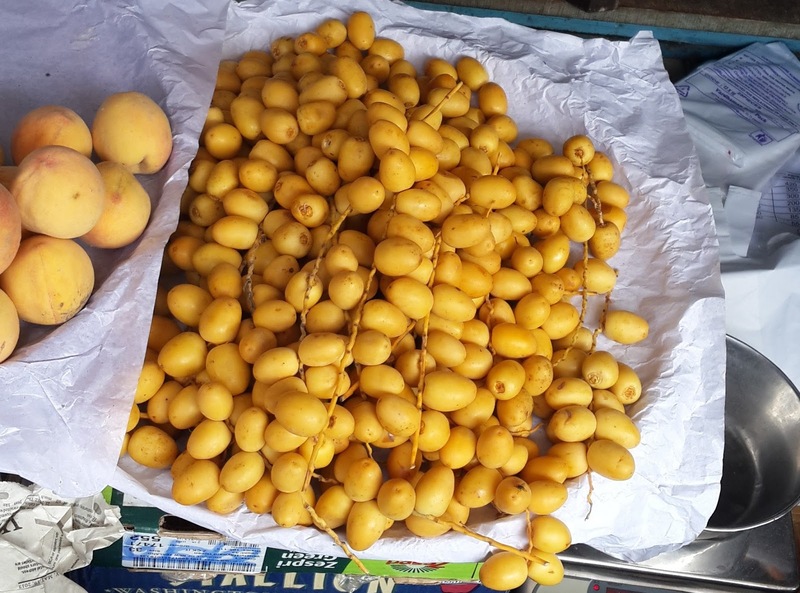 Have you seen all the gorgeous fresh dates in the market yet? They come in two colours, red and golden. I cajoled some vendors into giving me some to taste. Delightful! 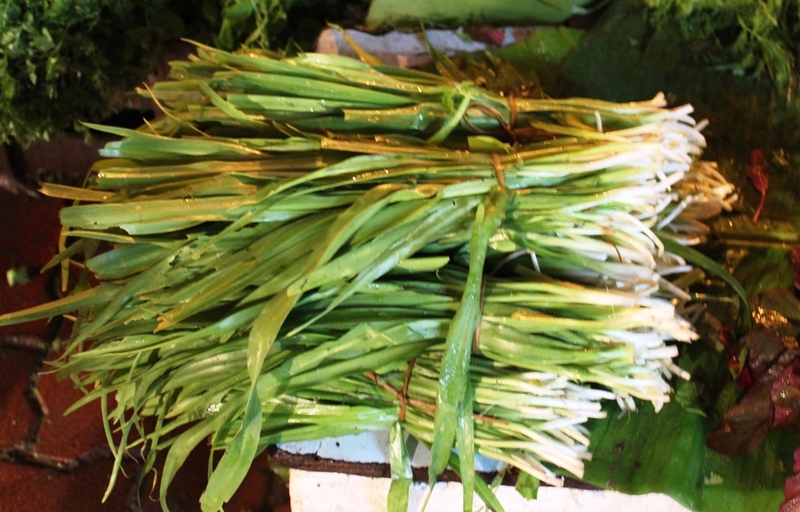 I also saw lots of tender bamboo shoots in the market the other day. "Who buys this from you?" I asked the shop keeper. "Manglur-wale", he answered. The Konkanis and Mangaloreans who shop in Matunga for beautiful coral and gold necklaces also shop for keerla (bamboo shoots) which is a rainy season delicacy. The outer layers are cut and the tender white inner portions are soaked in water, usually for 3 days. Each day the water is thrown out and fresh water is added. 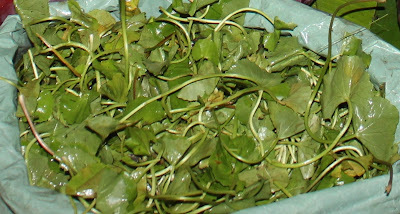 The cleaned shoots are then used in multiple ways. Some of it is kept in salt water for later use during the year, usually cut into discs. Some of it is cooked as dry curry or wet curry and eaten (usually with rice and some kind of dal). Usually tamarind, coconut, red chillies, onion are used in preparing the dish. 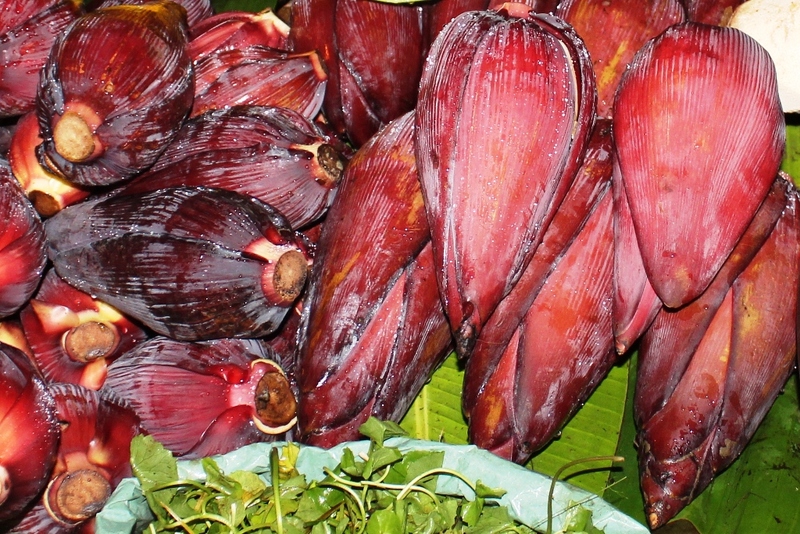 In the rainy season, vazhapoo, the banana flower, is back on the tables of South Indian homes. The banana flower is usually left to ripen as it holds the potential for huge bunches of the fruit within. But heavy rains and strong winds sometimes force huge single clusters free from the main plant. 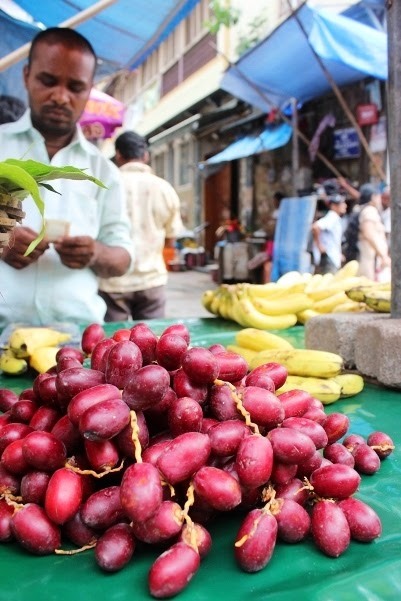 In the earlier days, families that owned abundant land had hordes of banana plants in the courtyard and these fallen fruits were treated as 'poor man's food'. Times have changed and family courtyards in the south now may hold just a few of the plant or if they’ve moved to cities, none. Today, the flower is a delicacy. 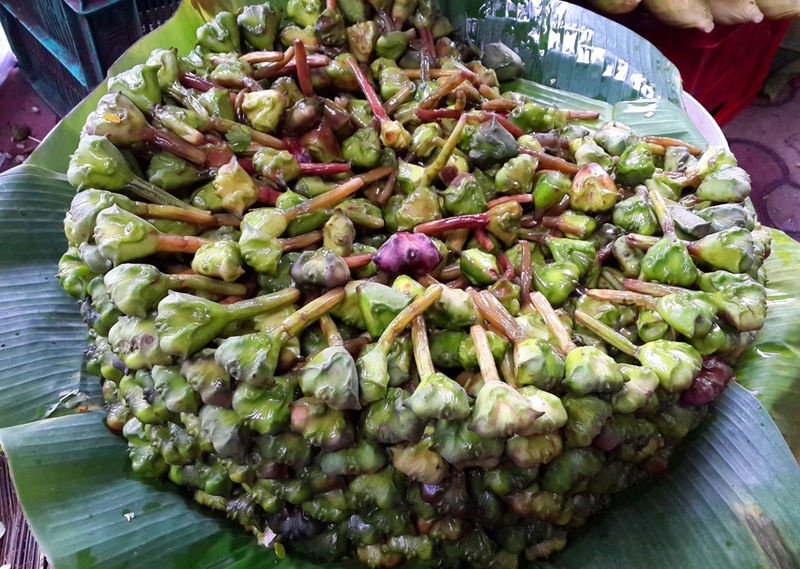 There are also lots of fresh water chestnuts in the market these days. I don't eat them, but my friends tell me you can just peel and eat them fresh. They certainly look very green and fresh. I have had them smoked / roasted over a coal fire. There are lots of other things in the market too. 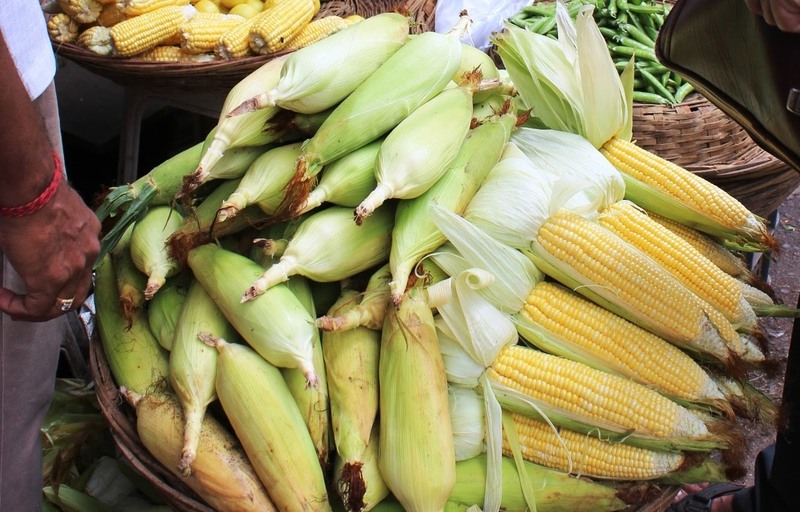 Fresh corn is in plentiful supply. And - since it is Shravan - there is also wheatgrass, for the keeping of "vrats". 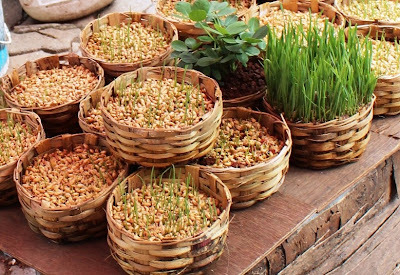 I don't think I'll ever comprehend these religious observances, but the wheatgrass looks fantastic, doesn't it? Does anyone have a recipe for me to try eating this? It is very healthy I am sure. Here's the wheat, germinating. I'm guessing this is just regular wheat, the sort that we make rotis with? How do you get it to germinate at home? 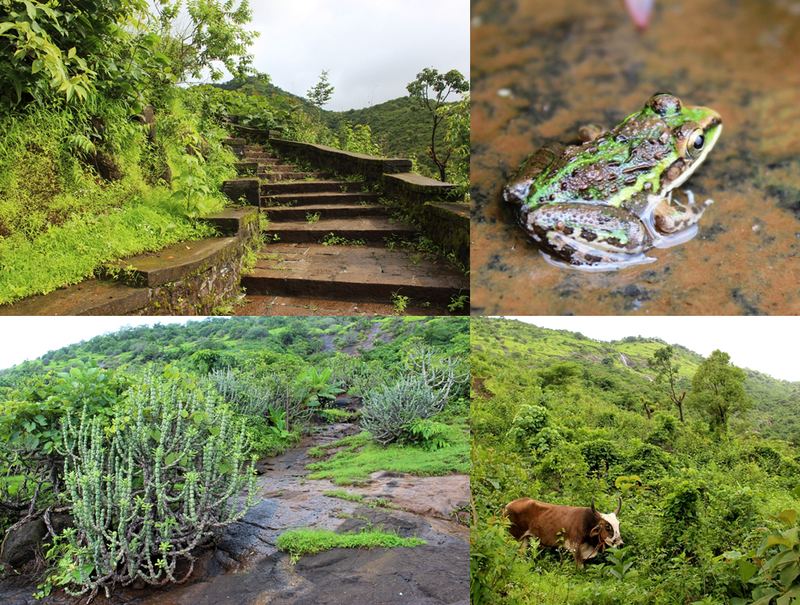 I hope you've enjoyed looking at all the photos :) In case you are wondering where I clicked all these, they are from Bhuleshwar and Matunga. There's so much variety in the market that I want to keep going and discovering more stuff. And there is so much to learn, about different cuisines and cultures. Anyone who wants to join me is welcome, but remember to bring a sturdy shopping bag! It is the monsoon season now, and every time I go to the markets, I see some seasonal specialty. Some of them are available in other seasons too, but right now they are extra nice and fresh. 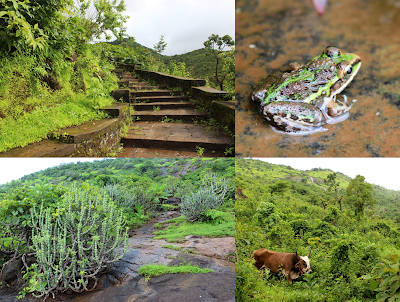 Since many of these monsoon treasures may disappear in October, I clicked some photos. The first photo below is of the teasel gourd; the Bengalis call it kakrol and the Gujaratis kantola. It is available in large sizes in the monsoon. Doesn't the photo look like a lot of little mice and their tails? :) :) If you haven't tasted it yet, then try it this monsoon! It's a bit like a karela, but without the bitterness. You can make a simple sabzi with it (just slice it, add salt and red chilli powder and fry it), or you can make a stuffed version with masalas inside. 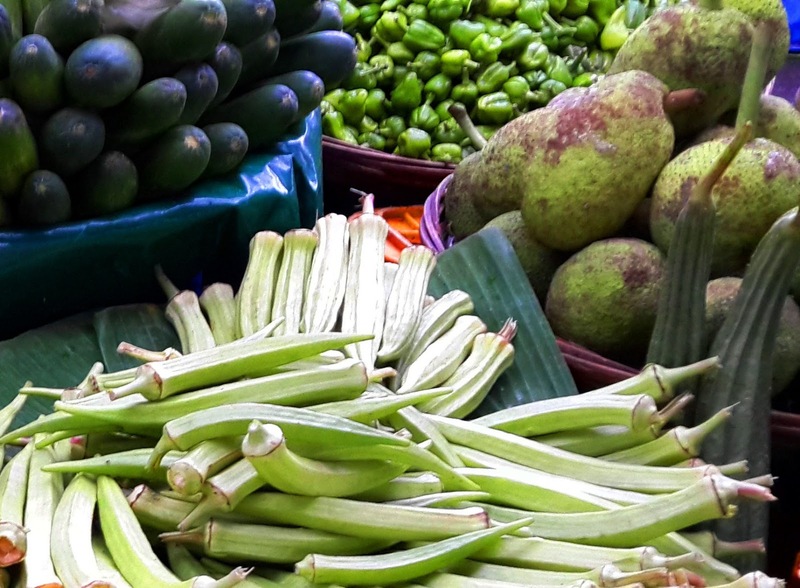 This year in the market I noticed for the first time, a pale green whitish okra (ladies finger, bhindi). It is much larger than the dark green ones, in fact, in one shop it was almost twice the size. When I asked the vendor about it, he said that it is less sticky than the dark ones. I first thought it was some new-fangled hybrid, but on further questioning the vendors, it looked like this is a traditional seasonal veggie. Among Gujaratis, it is cooked for a particular fast during the Ganpati festival. I'm told even when cooked, it doesn't become as soft as the regular bhindi. Have you tried this bhindi? Do you know more about it? Here's a fruit that I don't cook at all. 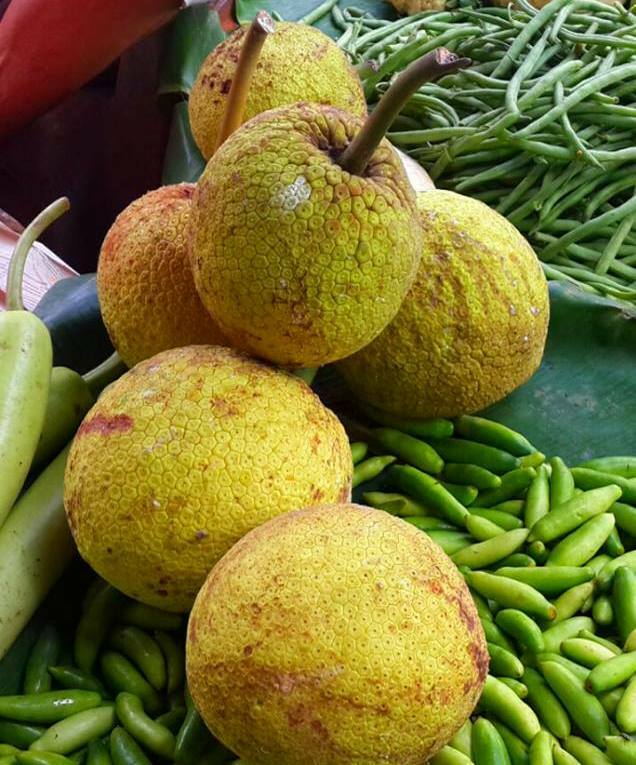 Breadfruit is found in Kerala cuisine, as well as the cuisine of the Konkan coast. The Malayalis call it kadachakka, and if you search online you will find several recipes for it. I've seen a recipe from Karnataka, where breadfruit is sliced, rubbed with tamarind paste, chillies and salt, and after about 5-10 minutes, it is coated with powdered rice batter and fried. I'm tempted to buy it on my next market visit! In the monsoon we sometimes get a kind of chives in the market. It resembles spring onion or garlic, but it is distinctly different and even a little bitter. 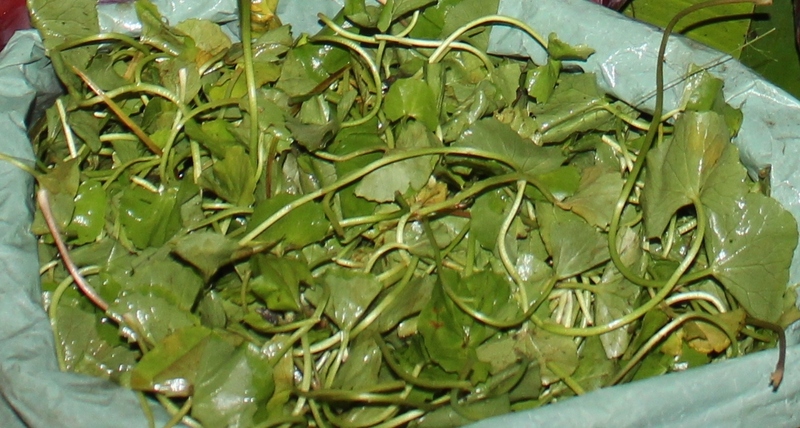 The local names for this vegetable are phodshi or kuli, and it makes for good pakodas. The big difference from garlic or spring onion is that with kuli/phodshi, we do not use the white roots. Also there is a thin stem in the blades which needs to be removed. Not available in any other part of the year. 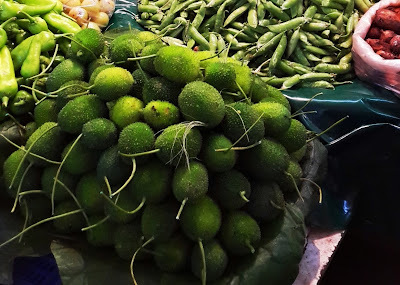 Another vegetable you see a lot in the monsoons is chow-chow or chu-chu, which the Kannadigas call seemey badnekayi. 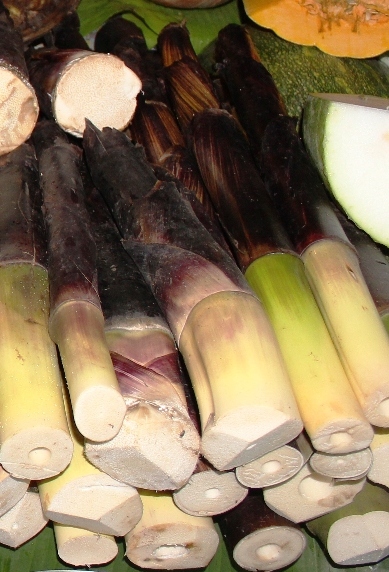 In South Indian cooking it is used to make kootu. 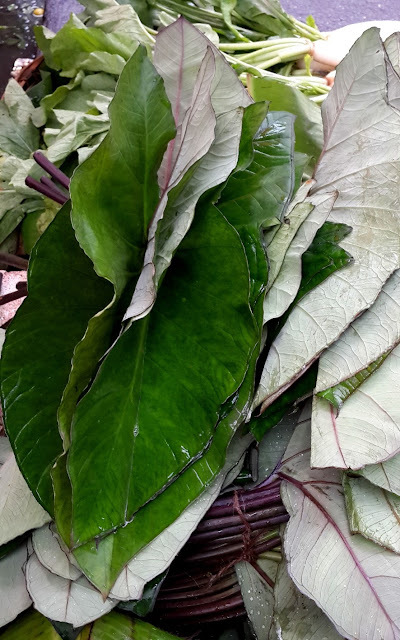 The Bengalis temper it with panch-phoron and bayleaf, and sometimes add a little milk, to make a sort of side-dish. 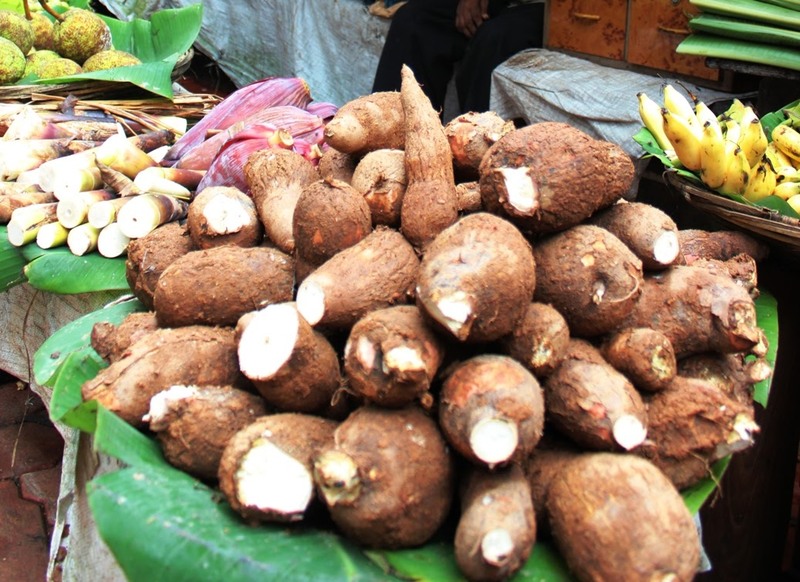 In Shillong it grows abundantly in the backyards, and is cooked along with meat. Here's another interesting find from the monsoon season: Brahmi leaves. This is a small leaf, shaped like the ear of a mouse. It has huge medicinal benefits, you'll find it if you just google it. 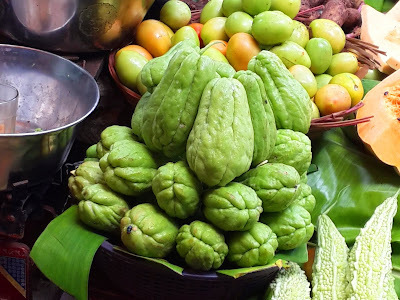 You can make a chutney with it, with coconut, tamarind and green chillies. Or make hair oil with it. In Tamil it is called vellarai keerai. Konkanis call it ekpanni, because there is only one leaf at the end of the stem. I think even in Kannada it's called ondelaga (one-leaf). Do you use it? What do you make with it? 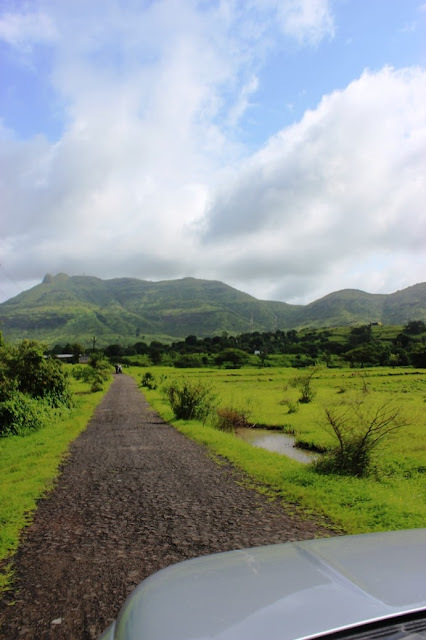 There are still several more monsoon delights, but it is late now and I better stop blogging! We are off to a trek early morning tomorrow in the hills nearby. I'll come back and post the next instalment of monsoon specials! Update: Here's Part 2 of the Monsoon Special!! Nearly 350 years ago, the people of Bombay listened to a speech by a man they knew and respected. The speaker, Gerald Aungier, was the Governor of Bombay from 1672 to 1677 and famous for his impartial dealings with both 'natives' and foreigners. 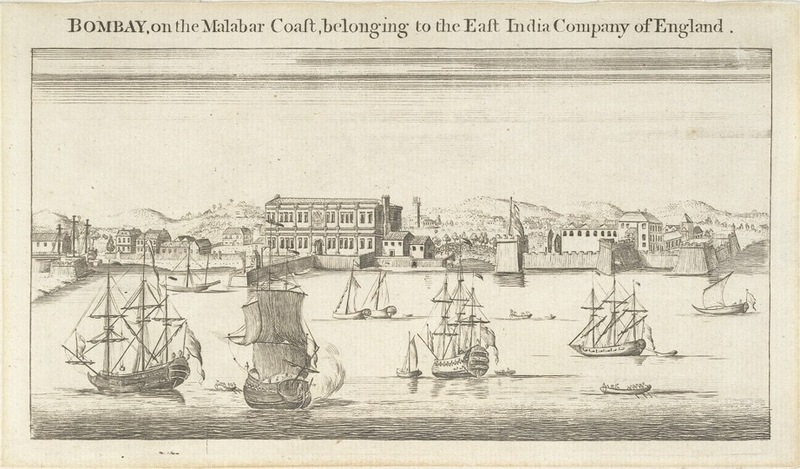 Mumbai in the 17th century, during Gerald Aungier's time. It was a very small settlement then. Very few people in Mumbai today have even heard of Gerald Aungier. 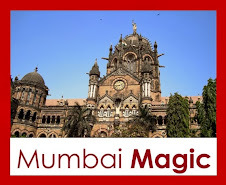 But city historians call Aungier the 'Father of Bombay' because he played a major role in the formative years of the city. In fact, I would even say that he was almost single handedly responsible for kick-starting the city's emergence as a great trading centre. Unfortunately for us, there are no portraits of Aungier, not even any descriptions of what he looked like. We do not know when he was born, or where. We do not know where he studied, or at what age he came to India. 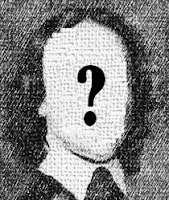 So even though he is the founding father of Bombay, he is a Mystery Man to us. The only clues we have about Aungier are from his letters and speeches, as well as what other contemporaries wrote about him. The speech that I read gave me my first real glimpse into Aungier's mind. 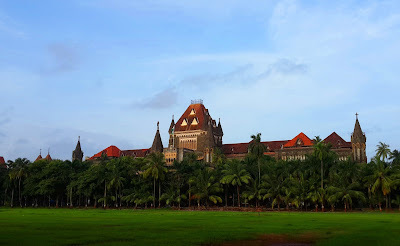 It was delivered by Aungier at the inauguration of the first British Court of Justice in Bombay in 1672. "The inhabitants of this island consist of several nations and religions, English, Portuguese and other Christians, Moores and Gentoos, but you, when you sit in this seat of justice and judgment, must look upon them with one single eye as I do, without distinction of nation or religion, for they are all His Majesty's and the Hon'ble Company's subjects as the English are, and have all an equal title and right to justice." Fine sentiments, and very relevant to the Mumbai of today, don't you think? If this speech had been made by someone else, I might think it was just fancy talk. But I have reason to believe Aungier truly meant what he said - that everyone in the city should get fair treatment under the law. 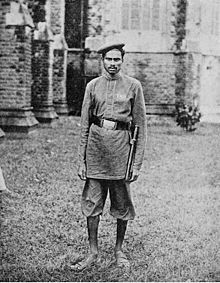 To understand why, we must go back to Aungier's previous experiences in India. Before coming to Bombay, Aungier was the Governor of Surat, the largest trading centre on the West coast at the time (in fact, the earliest written records we have on Aungier are about his days as Warehouse Keeper in Surat). 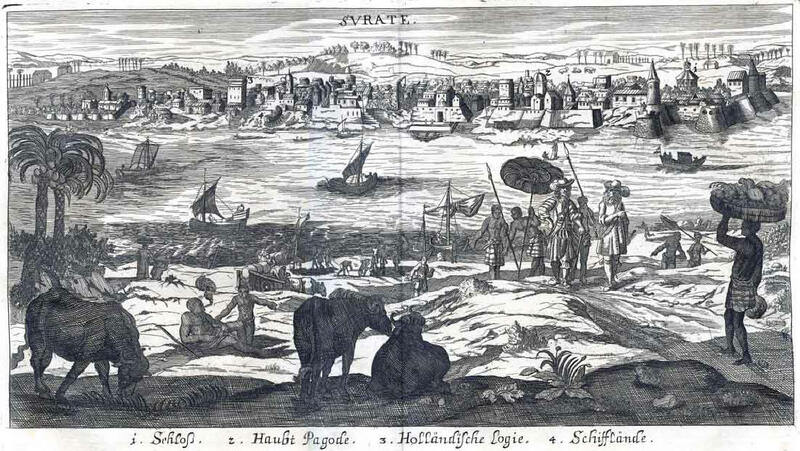 The Mughals had made Surat their most important port city in Western India, and even established an Imperial mint there. Arab ships called into Surat, so did Portuguese, Dutch, and British ships. To quote the Portuguese trader Duarte Barbosa, Surat was "a city of very great trade in all classes of merchandise". Apart from its famous bazaars, Surat was also the major departure point from India for the Haj to Mecca. If you click on the photo, you will be able to see how large and well developed the port city is, especially when compared to Bombay. Having lived in Surat, Aungier had dealt firsthand with the indigenous business communities of the West coast - Hindus, Jains, Muslims and Parsis. Most importantly, he had handled many political skirmishes between the Marathas and the Mughals; always making sure he stayed neutral. 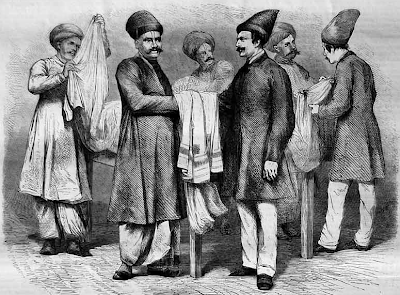 His experiences in Surat helped Aungier understand that a successful trading city in India needed to be multicultural and cosmopolitan . No one knew better than Aungier how critical it was for the merchant communities to have peace and order, to have a working system of arbitration and justice, and to prevent religion and politics from coming in the way of business. 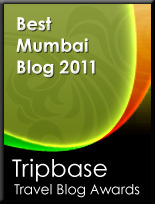 I found an interesting photo of some of the communities of Bombay. Although it is from the 1800's it will give you an idea of the kinds of people Aungier invited to Bombay to live and trade. When Aungier came to Bombay in 1670, he found many complaints about the Deputy Governor Captain Henry Young. He set about investigating and resolving the allegations. Dr. John Fryer, an Englishman employed as Surgeon with the East India Company says "He came and took the Government in 1671, where these three years he has regulated affairs with that prudence that whereas he found a disaffected and incongruous Council, he has now knit them into a bond of at least seeming friendship, and does daily study to advance the Company's interest and the good and safety of the people under him." By setting up a Court and appointing a Judge, Gerald Aungier laid the foundations of the Indian legal system (in the form in which it exists today). But that was not all Aungier did. He grouped the people of Bombay into communities and set up Panchayats, so that each community could regulate itself. The British courts were not accessible to the common man, so by initiating these Panchayats, he not only provided access to justice to everyone in the Fort, but more importantly, he ensured that each community took responsibility to maintain good behaviour amongst its members. of reforms" to encourage the growth of the city. 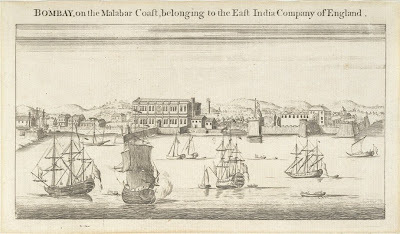 This included practical things like better fortifications, the setting up of the Bhandari Militia (the origins of today's Bombay Police), settling land disputes, signing deeds so that people could come to Bombay and be free to practice their own religion, setting up a mint, building a church, hospital and constructing other public buildings. He also negotiated a treaty with Shivaji, to keep Bombay free of Maratha incursions. In fact, the amount of work he accomplished in his short 5-year stint in Bombay is actually incredible. During Aungier's tenure the population of the city grew from ten thousand to sixty thousand. No wonder then, that he is called the Father of Bombay. In 1665, due to failing health, Aungier went back to Surat, but he continued to administer Bombay from there. He died in 1677 and was buried in Surat, in the same garden area where his predecessor George Oxenden as well as several other Englishmen were buried. Unfortunately, no one knows exactly which monument is Aungier's grave. In death, as in life, he remains a Mystery Man. English Cemetery in Surat, photo sourced from here.